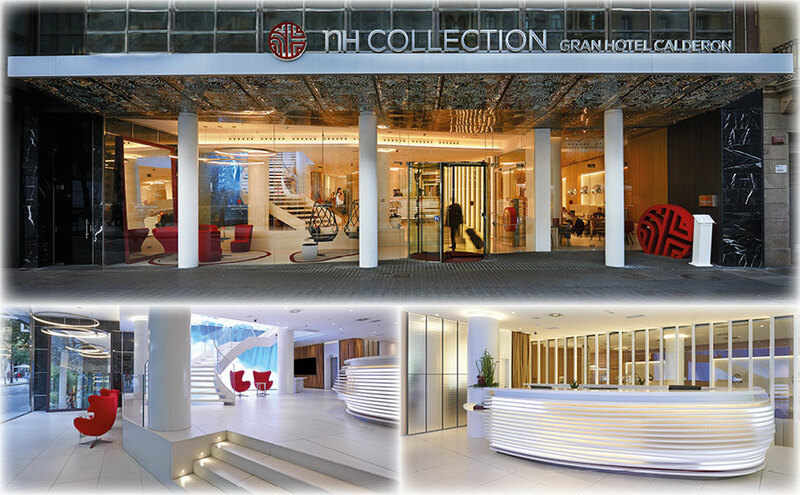 The renovated 5 star NH Collection Barcelona Gran Hotel Calderón is found at the heart of Barcelona, a few minutes’ walk from the main places of interest, such as the Casa Batlló, La Pedrera and the Sagrada Familia. Furthermore, the Guest Relations team of the hotel will help you to discover the less well-known Barcelona. The hotel is constructed on the original site of the Teatro Calderón. Both the theatre and the hotel were designed by the same architect, Josep Rodríguez Lloveras, a student of Puig i Cadafalch (one of the fathers of modernist Catalan design). You can have lunch or dinner at Don Giovanni, the award-winning restaurant recently opened by chef Andrea Tumbarello. After your meal, enjoy an original cocktail in C26. From its rooftop swimming pool and the terrace, 75 metres above the ground, you will be able to enjoy magnificent views of the city. We can find the compact mineral fromPORCELANOSA Group, KRION®, transformed by the company Maderama, in the reception furniture, created with our 1100 Snow White colour, combined with 4102 Extreme Light, a material which can be backlit, allowing a complex program to combine and generate all kinds of illusions on the reception counter.